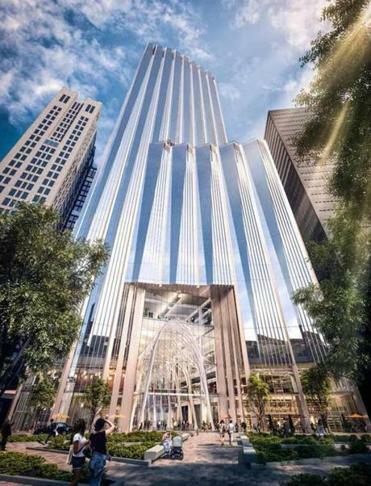 Architect’s rendering of the proposed tower at Winthrop square. A POPULAR DEVELOPER wants to take a decrepit, shuttered garage off the city’s hands and build a 750-foot Xanadu of glass and steel in its place. The developer’s offer of $153 million for the vacant garage far outbids its competitors and includes a three-story public “great hall” for restaurants, stores, and a performance space to activate the neighborhood between the Financial District and Downtown Crossing. Sure, the magic beanstalk building will cast shadows on the Boston Common for a few hours on winter mornings, but part of that $153 million can go to make needed improvements to the parks — as well as fund affordable housing and whatever else is on the city’s wish list. What could be the trouble with that? Plenty, say parks advocates and preservationists, who fear a slippery slope if Boston Mayor Martin Walsh succeeds in getting around a 1990 law that protects Boston’s historic parks from shadows cast by tall buildings. Few really believe the mayor’s assurances that the exemption he is seeking would apply only to the garage development at Winthrop Square. Other developers who have been stymied by the shadow law would surely demand equal treatment. “This would be the beginning of shadow creep,” said Elizabeth Vizza, executive director of Friends of the Public Garden. Soon Boston could become like New York City, where super-tall towers are being constructed along Central Park South, throwing long, thin shadows, almost like prison bars, across the city’s lungs. In a presentation last month, Millennium Partners, the site’s developer, admitted that shadows cast by the building would violate the law on more than half the days of the year on the Boston Common, and for about 100 days on the Public Garden. The much-loved, much-used lawn on Boston Common has a hard enough time without the added insult of shade, a horticultural condition that can’t easily be fixed with more water or fertilizer. And these are not just any parks — they are close to sacred ground in Boston, two of the city’s diminishing number of noncommercial civic spaces that are free and open to all. Fretting over a bit of shade when Boston desperately needs housing and other amenities may seem like another chapter in the NIMBY Chronicles. But the shadow law has been in place for 26 years and has hardly slowed the torrid pace of development overall. Maybe the law could be rewritten narrowly, so that exemptions only apply to city owned-buildings of a certain size, for example. The law already includes exemptions for the Midtown Cultural District and a potential tower at South Station, after all. Still, that would just solve one problem for one building. The bigger issue is a familiar one: the way Boston’s zoning laws and political culture encourage this kind of ad hoc horse-trading. Allowing a favored developer an exemption to zoning restrictions is precisely the sort of one-off negotiation that candidate Walsh said he wanted to end. The Walsh administration recently rebranded the Boston Redevelopment Authority with a new name to signal a fresh spirit of transparency and fairness. But the informal subsidies of public benefits by private developers continues. And some Boston legislators are incensed that they were kept in the dark about the shadow problem until the deal with Millennium was set. Rather than mitigate the impact of the shadows with expensive side benefits, why not just mitigate the shadows? Millennium Partners could deploy its army of architects and planners to find a new design or a new way to develop Winthrop Square. A tower of roughly 400 feet would be in compliance with the law. That wouldn’t be nearly as lucrative or yield the city the same amount of quick cash, but it would let the sun shine in.